Style of working has changed today and therefore a change in the workspace is also necessary. The commercial office designs are getting revamped depending upon the purpose it serves and interaction of employees with space. The classic cubicles and closed doors are now being replaced with multipurpose furnishings, dynamic designs, and open floor plans. Let us check out some of the new and innovative office designs and decorations that add a sort of freshness to your office. Wall Murals – Major companies like Facebook, Google, Verizon and likewise have incorporated expressive and dynamic wall murals in their offices that energize the entire office ambiance. Comfortable Lounges – Comfortable lounges such as couches, oversized bean bags, and so on can be found in numerous offices today that not only make the office look innovative but also offer comfort to the employees so that they would love to come to work every day. Acoustic or Sound-Proof Wall Panels – Acoustic wall panels let you to do your work in a quiet ambiance. These panels absorb sound creating an auditory privacy wherever you need it. Revised Wood Accents– A great and environmentally friendly design is to make use of revised wooden accents that bring rich color and detail of wood to space. Feel organic as well! Glass Partitions and Doors–Traditional walls and doors now have been replaced with glass walls and doors that provide an open layout. Glass walls and doors provide a delusion of an open space while at the same time restricting a given space and offering required privacy. These are just a few ideas and there are a lot more office design London ideas available with us at KOVA. 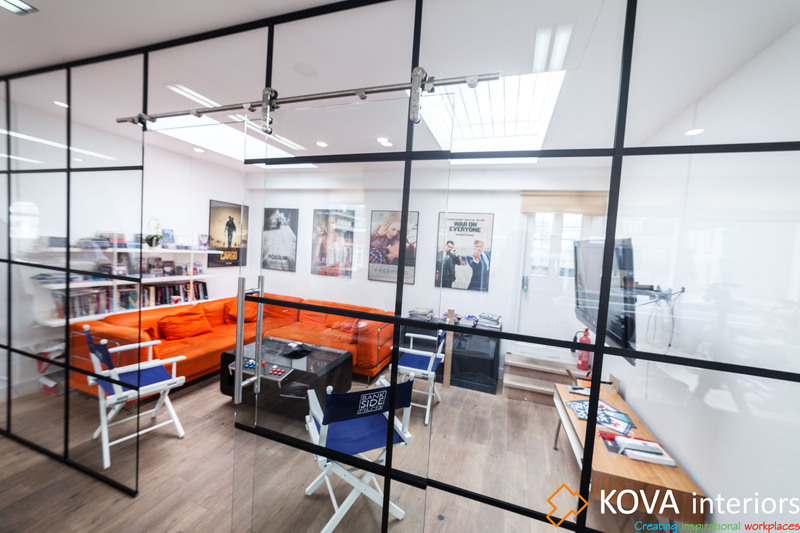 Here at KOVA, our team provides you with designs, layout options, 3D visualizations, walkthroughs as well as expert advice when it comes to designing your new office. We work by your side and ensure that your visions are transformed into reality. Whether you wish for refurbishing your old office or moving your entire office to a new location, our team is experienced in working flexibly with space, budget, and expectations.